1 How to quickly clean the pomegranate? 2 How to properly clean a pomegranate? Pomegranate - real storehouse of nutrients: minerals, vitamins, amino acids, microelements, natural antioxidants. Pomegranates help people during rehabilitation after diseases and surgeries. 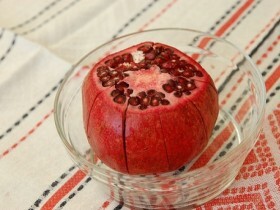 You should not deprive the attention and bright unusual taste of pomegranate, because of which so many like this fruit. one but: cleaning is very difficult given pomegranate extract and zornyshek. How to clean the grenades will be described hereinafter. How to quickly clean the pomegranate? 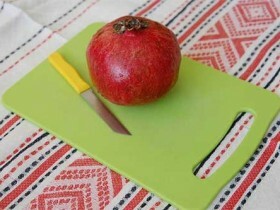 The method as fast as possible to get the main source of vitamins - squeeze the juice of a pomegranate. Knife fruit cut in half, each half is put on the cone of a special device for hand squeezing juice from fruit, rotated - all the liquid is drained into a container. This method will be used by people, who do not like to eat pomegranate seeds. How to properly clean a pomegranate? To do this, you need to roll the pomegranate fruit on the side of the table top and knock on it with a knife. Whereupon the upper part is cut fruit. Now we see, that there are several partitions inside it - a thin film of yellowish color, usually, their 8 pcs. In places, where partitions are attached to the peel, you need to make an incision on the thickness 2-3 mm. After that grenades can be "open", starting from the upper central portion. Now remove the grains of no difficulty. There is an even easier way to clean a pomegranate: you need to roll the fruit on the table, periodically tapping on it, then cut into two halves. Each part must be kept over a bowl or pan, while pounding a heavy knife on its outer side - in a few minutes all the seeds will be separated from the peel. Again need some time to roll the grenade on the table, tapping on it with a knife. Then after fetal incision tip shaped cross. 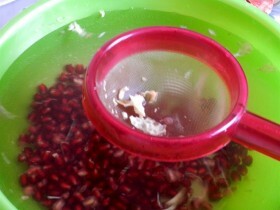 Pomegranate is placed in a container with warm water and begins to break apart right there hands. Do not be afraid to lose grain or squirt juice - water hides all errors. At the same time the most delicious - grains of, will lie at the bottom, peel and membranes will float. Water should be drained together with all unnecessary. To do this, you can use, eg, colander or strainer. After that, you can eat pomegranate seeds. It consists of tanks, resembling bowls, and grid. It can be purchased at a hardware store or ordered online. In order to test the method of working with this device, we can restrict improvised means: deep bowl, tukoy into the net (for the production of dumplings, eg), plastic bag. As usual, fruit for some time need to roll on the table, knock on it with a knife. Further, it is cut into two parts, each of the halves is laid on the mesh, which is already under a bowl. Everything is covered with a plastic bag. enough 8-10 tapping the fruit halves, to every single grains spilled into a bowl. The same is done with the second part. This is one of the easiest ways to clean grenades.